Howard Schultz will step aside as CEO of Starbucks next year, and Kevin Johnson, chief operating officer, will step up to replace him. The move comes as the firm faces an increasingly crowded market for higher-quality retail coffee shops and seeks to bolster foot traffic. 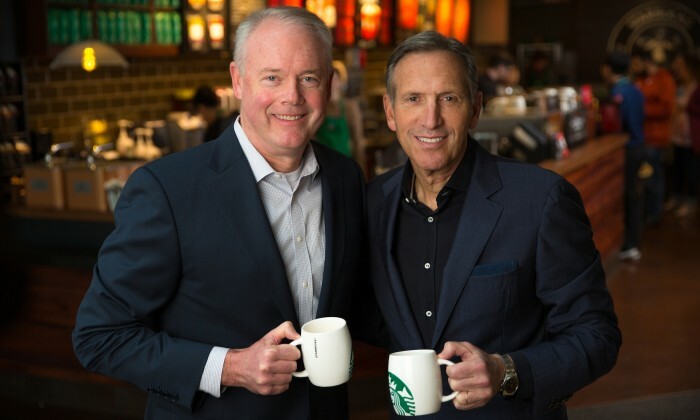 Schultz will become the company’s executive chairman on 3 April 2017, concentrating on ramping up Starbucks Reserve Roasteries, a new premium experience that the company is betting on to boost growth worldwide, as well as the company’s well-known forays into community activism. The coffee magnate, who has been with the company for more than 30 years, is credited with turning Starbucks into a global brand with name recognition comparable to McDonald’s and Coca-Cola. “Executives from premier global retailers like Apple, Nike and Zara have shared with me their view that the Roastery delivers the best retail experience – in or out of coffee – that they have ever encountered. Our Roastery is attracting customers and visitors to Seattle alike, and casting a bright halo across the entire Starbucks global brand and ecosystem,” said Schultz in an investor and media conference call. He added, going forward, he aims to open at least 20 Roasteries around the world, six by the end of calendar 2019 alone, and it plans to open more than 1,000 Reserve stores, a new premium coffee space that will highlight new brewing techniques, and artisanal food offerings. Starbucks has credited the rewards program and app for helping consistently increase sales, although growth has slowed more recently and traffic slipped in the latest quarter. Schultz has said such technology adaptions will become increasingly critical for brick-and-mortar retail businesses to thrive as shopping habits change. It’s the second time since Schultz bought Starbucks in the late 1980s that he has stepped down from the role of CEO. He resigned in 2000, only to return to the helm eight years later. The coffeehouse chain’s current situation is different from its position eight years ago, Schultz said, because the 2016 management team was better-suited to the challenges of the market than 2008’s senior staff had been. Johnson, the CEO-to-be, is known for his focus on building Starbucks’ mobile payments systems and executing the company’s global strategy. His career spans 33 years in the technology industry which included a 16-year career at Microsoft and a five-year tour as CEO of Juniper Networks. The company announced in October that it planned to double the number of its stores in China over five years.